Greetings from Texas. I’m Emily H. Blogging is as new to me as vegan-ism, but I’m welcoming them both with open arms. I can’t be more excited to discover what interesting things are ahead. My switch to healthier food might have something to do with the many years as a child eating greasy hamburgers, fried chicken, etc. and feeling sick to my stomach many many times. It’s my own fault though. I never would learn to eat my veggies. But, today I can say with confidence that I do eat my veggies, and I love them. I was always a picky eater, but over the last ten years I’ve gotten to know a few new veggies at a time. Last year I made the decision to cut out beef, pork, & poultry from my diet full time. So I still eat fish, occasionally. I guess it’s what Oprah calls “vegan-ish” – most of the time I follow a veggie/vegan diet. This summer I went experimenting into vegan adventures. I tried two new dishes at the Spiral Diner & Bakery. New to me. Not the diner. I made vegan green tea ice cream and vegan pizza. I can say at least two of them turned out pretty good. There’s this place on Magnolia Avenue near the historical neighborhood, where my grandfather grew up, that I discovered a couple years ago upon joining a wonderful community of meditation and yoga enthusiasts. 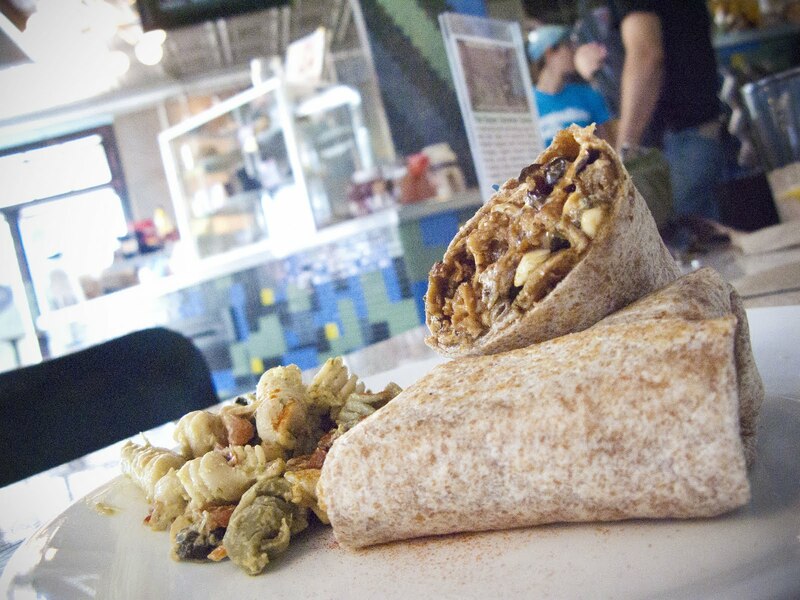 The Spiral Diner is 100% vegan and they also have a location in Dallas as well. I’ve been pretty addicted to their Spiral Burger. After giving up meat burgers, I always had that craving. The Spiral Burger can be a Classic patty, Nut patty, or Portobello patty and topped with your typical burger veggies. I believe I’ve tried classic and nut. It really makes me NOT miss burgers. So for most of my first visits there, that’s what I’ve had. Occasionally, I’ll try something else like the “Ate” Layer Burrito or some pasta dish. In June, I tried Bryan’s Brutal Tacos. 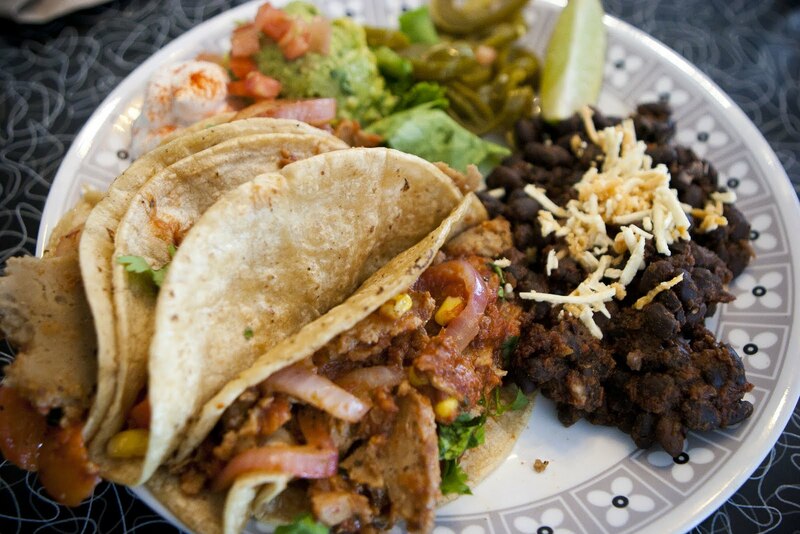 “Three tacos stuffed with seitan, corn, red bell peppers and onions, topped with lettuce and spicy taco sauce. Served with guacamole, sour cream, and black beans.” I wanted some variety in ethnic foods, and this one did not disappoint. I’m really big on making my own homemade food. Pizza has been a top favorite food of mine. And I’ve been making my own for several years. I use a dough recipe from Giada De Laurentiis. And change up the toppings from time to time. If I was curious about becoming a vegan, I needed to try pizza without regular cheese. A very good friend of mine recommended Daiya. So I made a margarita pizza with it. 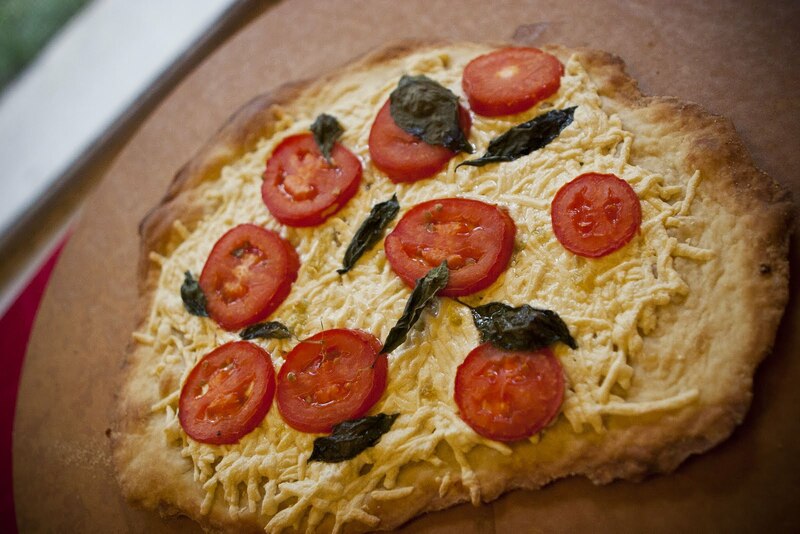 Olive oil on the bottom, then cheese, then tomato and basil on top. 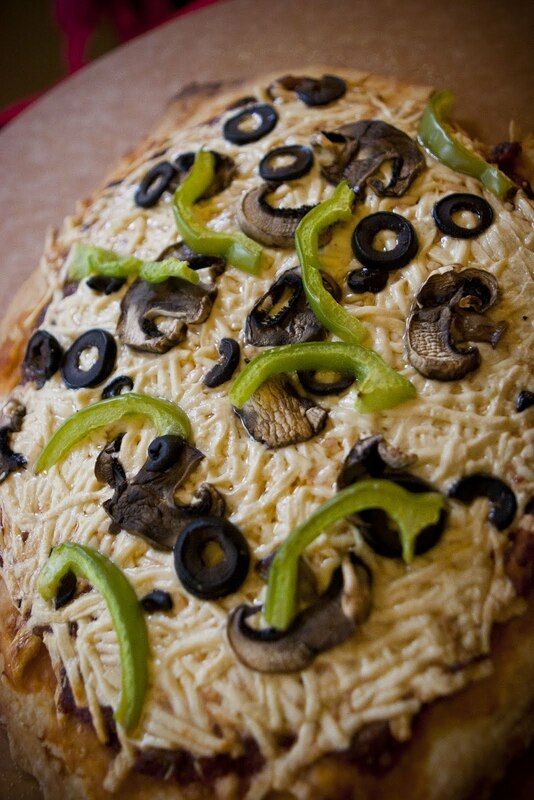 The dough, which consists of flour, yeast, water, and olive oil, makes two small pizzas, so on the other: homemade tomato sauce, cheese, mushrooms, olives, green peppers. I didn’t hate it, but it tasted funny. And I was beginning to miss my old non-vegan pizza. After that, I discussed it with two very smart vegans, and they both told me: if your not completely vegan and still eat regular cheese, it’s not going to be good. Patience will be needed on this one. My next visit to Spiral, I ordered Parmigiana Wrap, which I mistakenly missed that it includes the same kind of cheese I put on my pizza. Was good, but again not for the vegan curious. It came with some great pasta salad, that I love. And I also ordered some strawberry ice cream. One scoop topped with whipped cream, and a slice of strawberry. Looked so good, I dug into it immediately without taking a picture of the whole thing put together. I also tasted the icing off my friend’s cupcake. Yummy. One last adventure for the summer: I’d recently discovered my love for green tea ice cream. 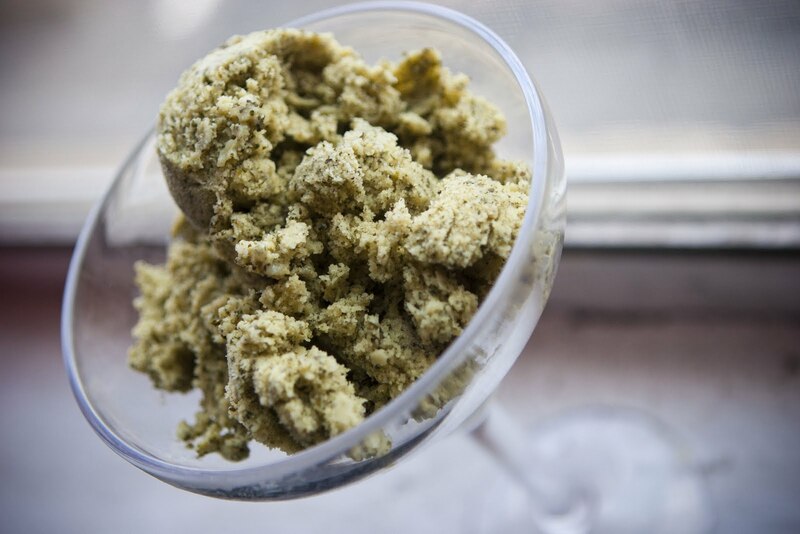 So I found a recipe online for vegan green tea ice cream. I’ve had an ice cream maker for three years now, and I’ve barely gotten any use out of it. So I kind of went crazy this summer with it. I followed the recipe exactly, except I used just plain soymilk. I couldn’t find anything called Edensoy. And the only matcha green tea powder I could find also came with leaves in them….in tea bags. You can make it happen, I tell myself. So I cut open all the tea bags thinking, that’s not enough. I’m going to have to go back and get more. Thankfully, before I left for the store I noticed I was looking at the amount for the soymilk and not the powder. No more mishaps, 40 minutes in the maker, and was done, ready to eat. Despite the leaves getting stuck in my teeth, was not bad. Gets a little grainy after a re-freeze. Also, note to self: don’t eat late in the day. The leaves are strong and will keep you wired half night. When I read that University of North Texas was going to get a full vegan dining hall, I had to check it out. It seemed so exciting to me, especially since when I started going there ten years ago, the food was nothing to talk about. I spent many a lunches my freshman year eating sub sandwiches at Kerr Hall, and then part of my sophomore year eating at Maple Hall for their paninis. But other than that, the rest of the food was typically cafeteria food. They are definitely not lacking in publicity for this thing. In a recent USA Today article, they were deemed the “nations first vegan cafeteria.” – But, I wanted to see and taste for myself. I promptly looked up the menu for the next week, contacted the head of the food services to make sure that a non-student was able to get in there, and planned a day to make the 45-minute drive there from my Fort Worth apartment. The menu still looked very cafeteria-ish, with only veggie stuff, so I can’t say I was expecting much. The first day of classes it happened to be, I took a quick walk through part of the campus. It had been about a year since I’d been on campus. I don’t get to visit very often. Steaming hot; swarms of students wandering around sweaty- typical first day. Ooh, a new business building across from my old dorm, I noticed. That used to be a tennis court. Beautiful architecture. Makes me get that new class fever, anxious to learn something new and have new experiences. I was about to have a new experience, I hoped. I walked over to Maple Hall and asked the guy at the front desk where to find the cafeteria. I couldn’t quite remember how to get there. “Take a right out that door, go outside, and make a left.” Maple Hall Cafeteria, now called Mean Greens Cafe. As I walked in, I was met by Ken Botts, the director of special projects for Dining Services. Since I did not have anyone to dine with for lunch and I was curious to know more about this place, I invited him to join me for lunch and chat about all things vegan. In the serving area, there is a regular cafeteria line for main and side dishes, a panini station, a salad bar, a drink station, and off to the side a place for cereal (still available for lunch). I had been a bit weary with things like panini and pizza on the menu, fearing there would be vegan cheese looming around. It’s no question me and vegan cheese don’t get along. But, there was no sign of it. Nope, not even on pizza. I chose a veggie wrap, eggplant with chopped tomatoes and basil, and an apple cobbler for dessert. The veggie wrap had various vegetables and pesto wrapped in a spinach tortilla. The eggplant tasted very much like an eggplant parmesan, except no parmesan. Couldn’t even tell it was missing. The cobbler was sweet, but not sweet enough to send me into a sugar coma like some do. Ken Botts, my dining partner for the day, was a vegetarian for 20 years living in California. Then he moved to Texas and discovered steak. After spending the summer trying out recipes while the cafeteria was building its base, he said he definitely wants to go back to that California diet. He talked up the cafeteria quite a bit, which he is going to do because he works there. But, it was delightful to hear so much enthusiasm about vegan-ism and generally just eating healthier. There was a high student request for more options, so they made it happen. And after speaking to some freshman eating there that day, it seemed that was true. 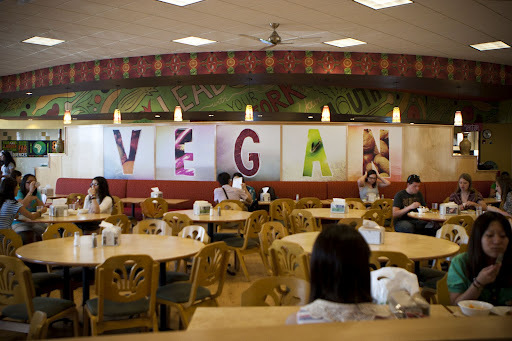 There were meat-eaters and vegetarians who were eating there every day, and were curious about the vegan diet. 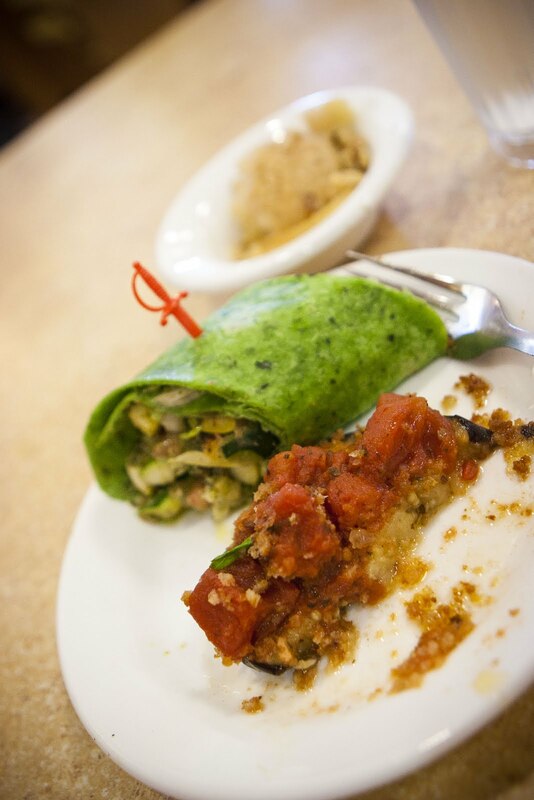 While the other cafeterias on campus are not 100% vegan, there seemed to be some vegan and vegetarian options on their menus that day. 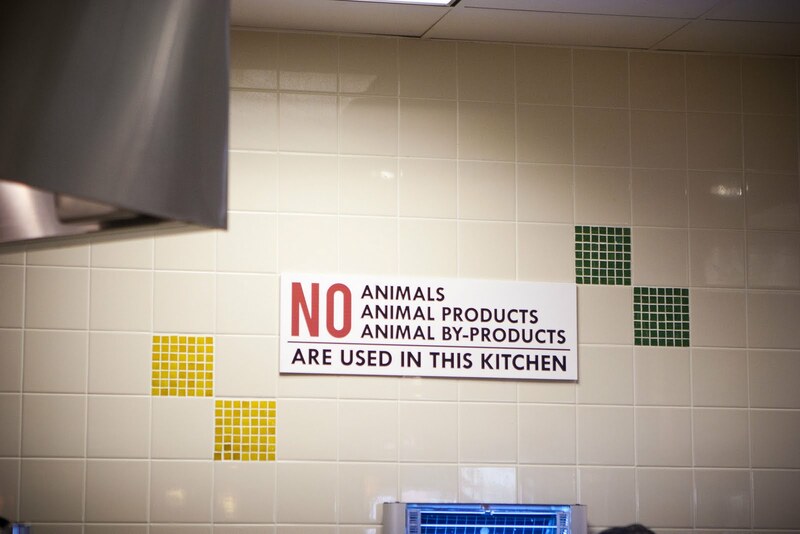 However, without actually going into the other cafeterias, it’s hard to say what they would be like. Perhaps that’s a blog for another day. After chatting and eating, I had room for one more. I decided I couldn’t leave without trying a panini. At the panini station, I made my selections on a piece of paper with my name on it (kind of like Which Wich). In 2003, my panini had turkey and provolone. No veggies. 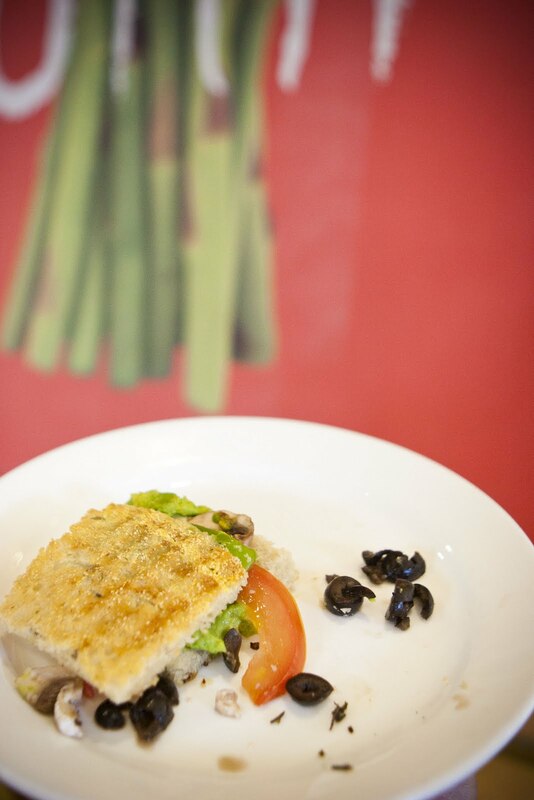 In 2011, my panini had olives, mushrooms, tomato, green peppers, and avocado. No cheese. On a light foccacia bread. 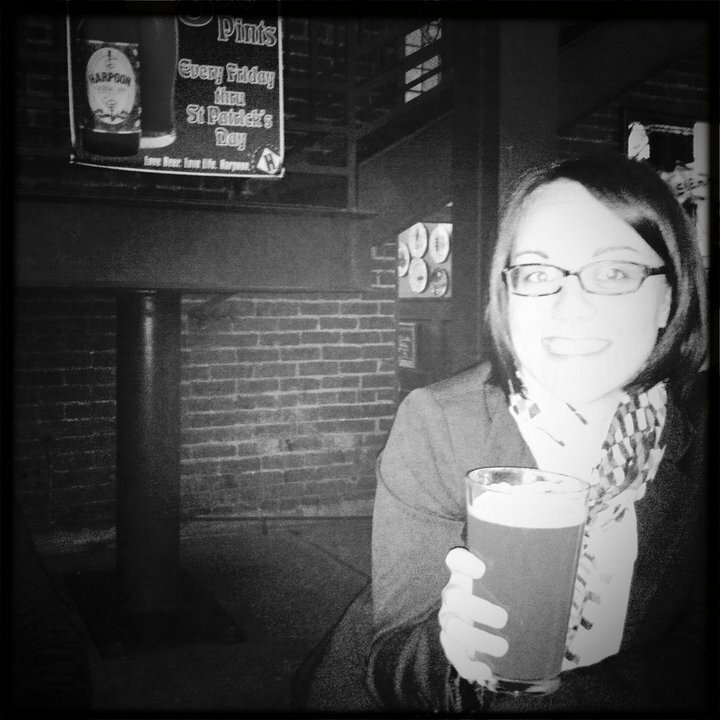 Both were very tasty, but this time I didn’t feel heavy or the need to go take nap afterward. It cost me $6.50 plus tax for lunch. For all the food you can eat there, I thought that was a pretty good deal. One-tip: If you are a commuter or a non-student like me, park in the lot across the street with the Chicken Express. Parking can be a hassle on campus.